Poetry is about the quest for beauty often through pain. 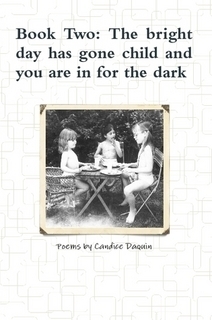 Daquin’s poetry weaves the transition from youth to adulthood in new and spellbinding ways. An exquisite exploration of hard truths, Daquin is a revelation. Each poem offers the reader something a little different, sometimes dark and sometimes darker, but never anything less than excellent.Having read and loved book one in her poetry collection, I can only marvel at what might come next. Candice Louisa Daquin - Candice Daquin has written poetry reviews online for the last decade, as well as working in the publishing world. She has a background in teaching and working as a therapist primarily with trauma survivors. She devotes a good amount of time to her writing, a passion since childhood, and is an ardent believer in equality for all. A Jar For The Jarring, was her first book available through , Barnes & Noble and local Texan bookstores including; Book People of Austin. Book Two: The bright day has gone child and you are in for the dark is her second poetry collection utilizing themes of immigration, transformation and changing identity. Book Three: Illusions of Existing, focuses on memory and love, considering the roles they play in our life choices. Currently Daquin is joining with other writers on collaborative writing and poetry, as well as being published in online magazines and working on her next book.